A few weeks ago, China celebrated Qingming Jie (清明节Qīngmíng jié), which literally translated means “Pure Brightness Festival.” The English translation, Tomb Sweeping Day, highlights how people traditionally celebrate this festival: they clear away the weeds from ancestral tombs and make offerings for the dead. This year, Qingming Jie fell on Saturday, April 5. All over China, the dutiful set fake money ablaze on street corners, outside their doorsteps, and on tomb stones. They journeyed to graves, cleared away the weeds, and set plates of food and fruit on altars. To human eyes, the money went up in smoke and ashes. In the hereafter, however, the spirits may use this money for whatever spirits need to buy. Maybe they rent a condo in an upscale spirit neighborhood with a view of a celestial temple. A few days after Qingming Jie, I talked to an elderly woman whose husband died three years ago. At the end of his life, he had lost his mind to dementia. He wouldn’t eat. He couldn’t talk. He wouldn’t wear clothes. She worries that in the afterworld (另外世界lìngwài shìjiè) he doesn’t have any clothes to wear, so during Qingming Jie she burns money. She feels that her husband needs the money to buy clothes. I asked her what else he does in the next world. Besides shopping, he probably has other interests. Of course he does. He goes fishing. While slurping on his egg and vegetable soup in a “Chinese Hamburger” restaurant (really that’s what the sign said), a cabbie driver told me spent his Saturday worshiping his ancestors (拜先祖 bài xiānzǔ). He and his family are from Beijing, so visiting the tombs of his dead relatives is very convenient. He brings them food and probably burns fake money. I asked him if he believes that the dead continue on in the afterlife. He didn’t give me a direct answer (that means he said a lot of things that I didn’t understand through his garbled Beijinghua—so whether the answer was yes or no is unclear), but he was clear that Qingming Jie is a very important in Chinese history. It is culture. It is tradition. Such practices, however, are slowly fading with the younger and secularized Chinese. Millions of young Chinese leave their hometowns— fortresses of traditions—to live, work, and study in big cities. They leave behind the ancestral tombs, and their aging and superstitious grandparents. They embrace a secular way of life, consumed with higher education, finding a satisfying job, finding a spouse and having children. Money is king to many of these young bookworms. The old traditions are fun—but not spiritual or even necessary. One young graduate student told me that as a child she accompanied her parents to the ancestors’ tombs to burn money and to offer food. Now both she and her parents live in Beijing. Their hometown and the tombs are too far away to make the long trip to traditionally commemorate Qingming Jie. She does not think that her dead ancestors need her money. She's not sure if she believes in life after death (línghún 灵魂). Instead of burning real money on fake money to literally burn, she spent 10 RMB (1.60 USD) on an entrance ticket to the Beijing Botanical Gardens. Yes, she spent Qingming Jie as most people with a day off do: she went out and played. 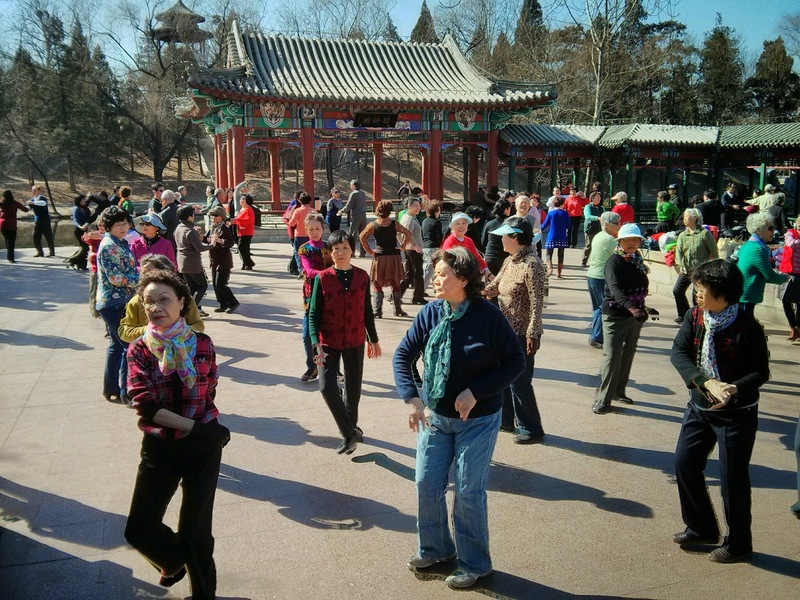 Everyone went out to play at the Beijing Botanical Gardens. There were as many people as flowers. 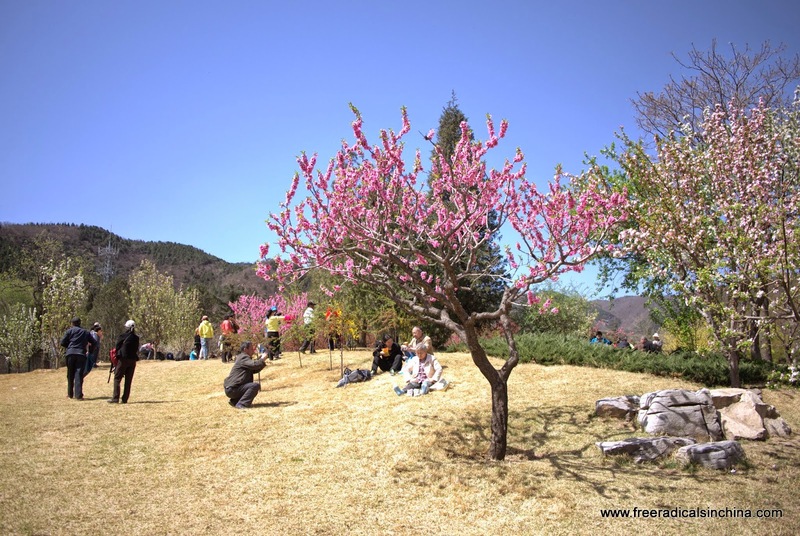 Beijing saw blue skies on Qingming Jie. The ancestors must be pleased. Spring came on time this year. Despite the long stretches of severe pollution, the magnolia, cherry, plum, and peach buds opened wide to the sky and said, “Take that smog, I AM ALIVE.” Unfortunately, the lifespan of these awesome blossoms are awesomely short. 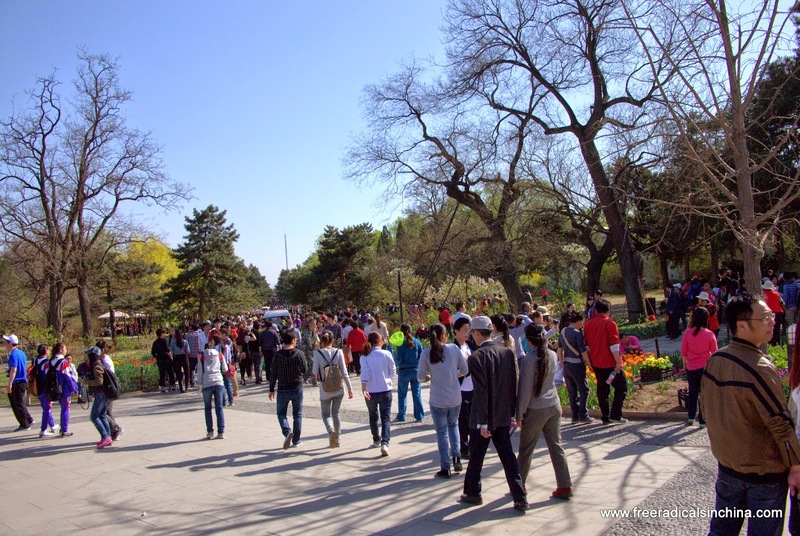 The Beijing spring is short, and cool weather quickly transforms into hot weather. No spring jackets needed here. On that note, Beijingers have shed the gloves and winter hats, but are still walking around wearing wool coats and sweaters. The thinking is you should wear as many layers as you can until you can’t stand it anymore. If you do not dress warm during the not-so-hot time, you will be too hot in the summer. That is, when the weather is a pleasant 70F, sweat it out under layers of clothes so you will be cooler in the summer. I reject this thinking. Cold is cold is cold. Warm is warm is warm. Hot is hot is hot. Dress accordingly.